This Second Edition features new discussions of relevant security topics such as the SSH and WEP protocols, practical RSA timing attacks, botnets, and security certification. New background material has been added, including a section on the Enigma cipher and coverage of the classic "orange book" view of security. Also featured are a greatly expanded and upgraded set of homework problems and many new figures, tables, and graphs to illustrate and clarify complex topics and problems. A comprehensive solutions manual is available to assist in course development. 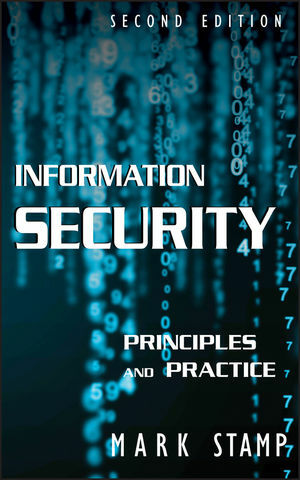 Minimizing theory while providing clear, accessible content, Information Security remains the premier text for students and instructors in information technology, computer science, and engineering, as well as for professionals working in these fields. Mark Stamp, PhD, is Professor of Computer Science at San José State University, where he teaches undergraduate and graduate-level information security courses. In addition to his experience gained in private industry and academia, Dr. Stamp has seven years' experience working as a cryptanalyst at the U.S. National Security Agency. He has written dozens of academic papers and two books on the topic of information security. 1.1 The Cast of Characters. 2.2 How to Speak Crypto. 2.5 A Taxonomy of Cryptography. 2.6 A Taxonomy of Cryptanalysis. 4.7 Uses for Public Key Crypto. 5.2 What is a Cryptographic Hash Function? 5.8 Uses for Hash Functions. 6.3 RC4 as Used in WEP. 6.4 Linear and Differential Cryptanalysis. 6.5 Lattice Reduction and the Knapsack. 7.7 Single Sign-On and Web Cookies. 8.2 A Brief History of Authorization. 9.6 The Best Authentication Protocol? 11 Software Flaws and Malware. 13 Operating Systems and Security. 13.4 Next Generation Secure Computing Base.